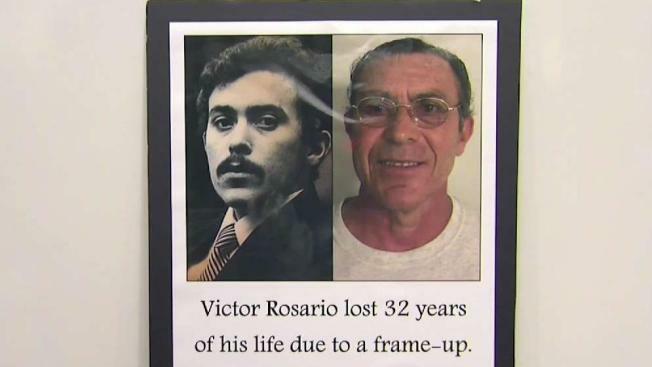 A man spent 32 years in prison for a crime he didn't commit. Now that he's been exonerated, he's suing some of the people who put him behind bars. A man who says he was wrongfully imprisoned for more than three decades after being convicted of starting a 1982 Massachusetts fire that killed eight people is suing officers he says forced him to falsely confess. Attorneys for Victor Rosario filed state and federal lawsuits on Thursday against the city of Lowell and several police officers. A judge vacated Rosario's murder and arson convictions in 2014, citing questions about whether his confession was voluntary. After the state's highest court upheld the ruling in 2017, prosecutors said they would not retry him. Rosario's attorneys say investigating officers used "outright lies, coercion, threats, mistreatment and sleep deprivation" to force him to falsely confess. Lowell police said the department doesn't comment on pending litigation. An email was sent to the city attorney.